A delightful variety, Clematis 'Mrs George. Jackman' freely produces beautiful, large creamy-white semi-double flowers with coffee-coloured centres which appear during late spring and early summer, followed by single flowers towards the end of the summer. This non-evergreen climber can be grown up a trellis, pergola, along a fence or wall or would look stunning in a container on the patio, supported by bamboo canes or an obelisk. 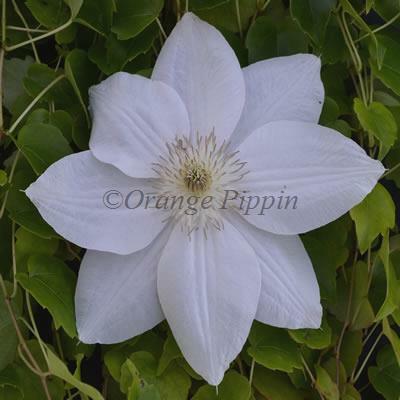 Clematis 'Mrs George Jackman' was raised by George Jackman of Jackman and Son, England.